The Story of Mike the Headless Chicken. No lie. If you like this sort of thing, I highly recommend the How Stuff Works: Stuff You Should Know podcast. Irreverent and fun. I don’t have much time to listen to podcasts anymore (anyone have any tips for when is a good time to listen when you don’t drive much anymore? ), but I always enjoyed theirs. Well, I know that now it’s the beginning of the new year already, but I saw this on Discover‘s blog yesterday: “The stupidest things celebrities said about science in 2009.” I can’t resist stupid celebrity quotes, and neither should you. A short synopsis is here. And a little more detail over here at New Scientist. My favorite thing that I learned from this is that meat stays in your gut for 40 years and eventually leads to your death. I’m so glad that celebrities are smarter than me. First, I have gotten myself all fired up by writing a quick review of a book I just read. It was supposed to be about the legend of the origin of the Assateague Island wild ponies, and it was so not. My review is on LibraryThing. Consider it a PSA for those who want to know about these ponies and might mistakenly pick up this book thinking it has some useful information. Second, I have run across some real gems on the web lately and would like to share. – A woman is pregnant. Two times, two babies in one womb. It’s just that they were conceived 2 weeks apart! Cool huh? – Here’s a nice post from the Marine Life Encounters Blog. Video and pictures of a recent dive in Bonaire. So neat. Particularly the flounder spawning, especially if you have never seen how they swim. – I love Discover magazine and their blogs, which dispense science in bite-sized bits for those of us too lazy/too busy/too poor to read journals, but come on. This title caught my eye (of course! ): Jell-O Shots in Adolescence Lead to Gambling Later in Life. Weird, huh? Well, all it is is a synopsis of a study showing that rats who consume alcohol at an early age display more risk-prone behavior than those that don’t. First: DUH, and second: Why not just say that? The more you make science appear deceptive, the more people don’t understand it, don’t want to fund it, and ignore it at their own peril. Sigh. Aaaaaaand, once again, time for the 7 Quick Takes update, brainchild of Jennifer at Conversion Diary. Sorry I missed last week, but it was kind of crazy around here. 1 – The last time I did this, I posted that I was scheduled to go on a surprise date with my husband. It turned out to be awesome! It was dinner and a free outdoor concert, and we had a great time. Weather was perfect and music was great. In these days of saving money constantly, it was nice to go to a concert, since neither of us has been to one in a while. In fact, my last concert may have been TWO YEARS ago when I saw Barry Manilow in Las Vegas. Wow! That’s frightening….not the Barry Manilow part, cause I really like him (yes, I know…)- but the two years part! 2 – I am a TV addict. It’s time to admit it. This week, though, is especially fun for my addiction. Wil Wheaton guest starred on Leverage, and there is another very funny new episode of Psych lined up for tonight! 3 – I got replies about THREE jobs this week! Yay! Nothing concrete yet, but at least some responses finally. It’s a sad day in the world when a teacher can’t find a job, you know? 4 – We got a new hermit crab. I have posted about my hermits (or “hermans” as we say in my family) before- we are a little too attached to them, yes, but they are so cute and interesting! We “rescued” one from a beach shop where they were being kept in a wire cage with no food or water. Very sad. However, this herman is very spry and loves to be held- he is not scared of us at all. He’s also HUGE- bigger than a golf ball (I can’t think of something that size to compare him to). I don’t have a pic at the moment but will try and post one soon. 6 – I found this cool song on another blog I read. I love Taylor Swift (although not in an obsessive teeny-bopper way like 99% of her apparent fans), and this is a neat composition. I apologize for the absence of another entry in this series, especially since my 2 buddies who helped me come up with the concept have been anxiously waiting, so…drumroll, please……….! Our next “Hot Man of Science” is actually two men. It’s Adam and Jamie from Mythbusters! Everyone has their favorite Myths that have been tested by the team…one of mine is the whole episode of Shark Myths based on “Jaws”– I show that one to my Marine Science classes all that time. In fact, my co-teacher was going to try and make a “Sha-rammer” one summer so that we could use it to decorate our classroom, but it just wasn’t meant to be. Another great one is the recent episode where Jamie flew with one of the Blue Angels (U.S. Navy Flight Demonstration Squadron- GO NAVY!). Actually, I can’t even remember what myth they were testing there, it was so entertaining…(edit: I looked it up, and it’s testing if a sonic boom can break glass.) Check out the video “Savage Test Flight” (warning – as is usual with the Mythbusters, there are many gratuitous “cookie-tossing” scenes, as they put it). Lastly, for the total Mythbusters geeks, here is a website that lists all the outcomes of their tests. And they have many! This came out of a discussion between me, my co-teacher, and my student teacher…while watching “Dirty Jobs” today (hey, it’s testing week and their brains are fried) we were discussing hot male science types, much to the chagrin of the students. Anyway, we came up with at least 3 hot men in science or pseudo-science related jobs (aka TV) and I joked that I should put it on my blog….ta-da! So, on to it. 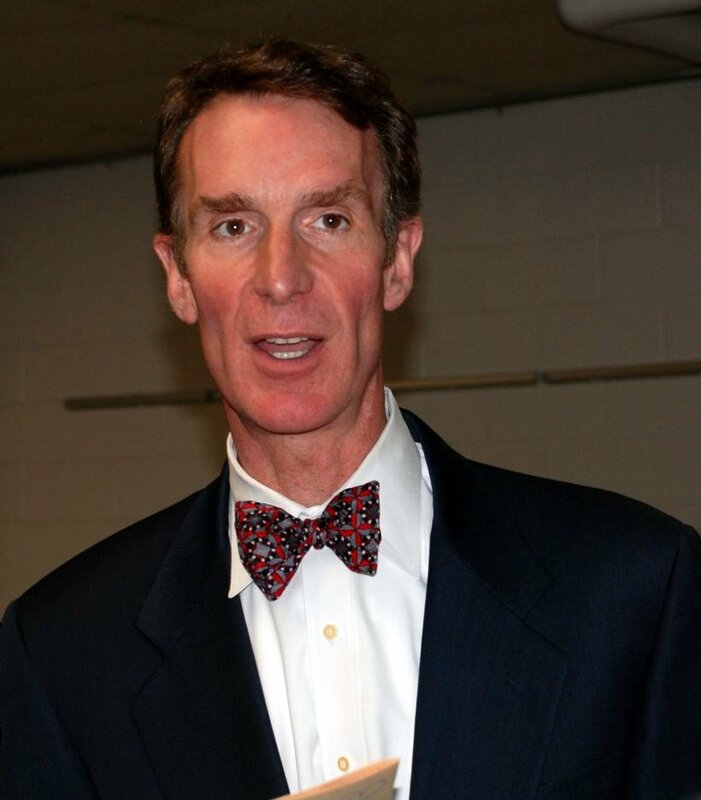 The first “Hot Man of Science” comes from the suggestion of my friend and co-teacher, and is Bill Nye! He’s also done some other shows aimed more at older students (and their teachers who are highly annoyed by his propensity to repeat things 3 times in a row, in a successively louder voice each time), but my students always want to watch the “old-school” stuff. Classic Nye, if you will. He attended the Sidwell Friends School in Washington, DC. He is an occasional guest star on “Numb3rs”. He has been the subject of a parody in The Onion. He loves and plays baseball, and has been rumored to be a Washington Nationals fan. There’s a rumor in the science-teacher crowd that his ex-wife tried to poison him. This article is the closest thing I could come up with. Either way, she clearly did not appreciate him. So, there it is- the first in the occasional “Hot Man of Science” series. I already have 2 more lined up, unfortunately- that uses up all the ones I can think of off the top of my head. Suggestions are welcome! This TED talk by Sylvia Earle says it all. She is an amazing scientist and one of my heroes. If you have never thought about why the oceans should matter to you, please watch!